This incalmo bowl is made from 3 separate sections. Incalmo is an extremely complex technique where each section is made separately and then they are joined one at a time while the glass is still hot. 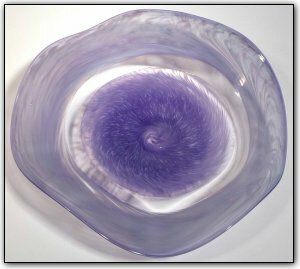 The inner and outer sections both feature many shades of lovely purples separated and accented by an elegant band of clear.